Simple Homemade Cinnamon Rolls are a Thanksgiving tradition. 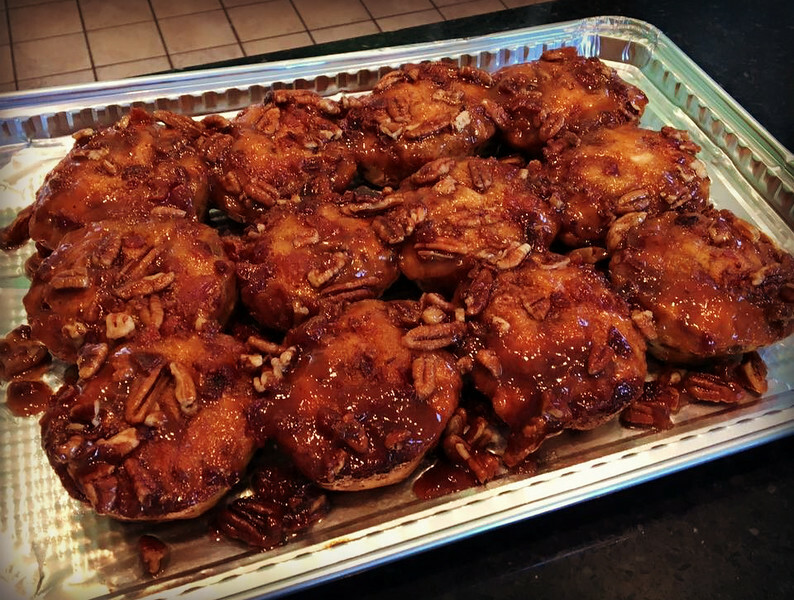 In our family, homemade caramel cinnamon rolls are part of a very traditional Thanksgiving breakfast. It is a hearty, country-style breakfast that includes sausage, sautéed potatoes, scrambled eggs, lots of strong coffee, frosty orange juice, assorted fresh fruits (or fruit salad) and, of course, my freshly baked cinnamon rolls. I started baking traditional sweet dough cinnamon rolls for breakfast at Thanksgiving and Christmas at least 35 years ago trying to keep a Pennsylvania Dutch tradition alive and well. These days, the holiday season is not complete in this family without a big batch of caramel coated cinnamon rolls. They have become holiday treats and even holiday gifts. In the past few years, a new family tradition has emerged that makes it necessary to either transport these rolls already baked or else bake them fresh on the spot. The new tradition? A Thanksgiving family reunion at the beach. The beach in November? Yes, for some reason we like all that sand between out toes even in winter. We never thought about it until recently but we are somehow drawn to the Delaware shoreline where our English ancestors landed on their voyage to the new world. Winter beach week takes a lot of planning but yes, it sounds and is a lot of work but boy is it fun! Use a selection of wonderful Bed & Breakfast style brunch recipes! 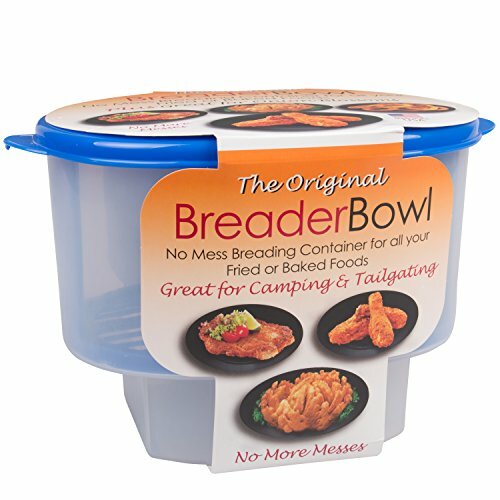 We take our entire Thanksgiving celebration on the road – including the food. More specifically, we rent a huge house on a favorite stretch of beach, where family members near and far can gather to spend a week together under one roof. Sometimes, the weather cooperates which means all able bodied family members participate in the sunrise Boardwalk trek. Everyone take turns at assembling a new puzzle. There is a football game or two to watch. And let’s not forget the lighting of the Christmas tree ceremony! Sometimes it rains or even snows. That’s when we put an extra log in the fireplace, brew another pot of coffee, make a big batch of hot chocolate and warm up any leftover homemade caramel cinnamon rolls. We gather around the dining room table and share the newest photos, everyone catches up on school news, the mandatory 1000 piece puzzle makes an appearance and we’re off to the races. That leaves Mom and Grandma in the kitchen. In other words, me. It’s rather amusing to judge a beach house by how well equipped the kitchen is…but that’s how we roll. I’m usually feeding about 15 to 18 family members for breakfast, lunch and dinner. For close to a week. 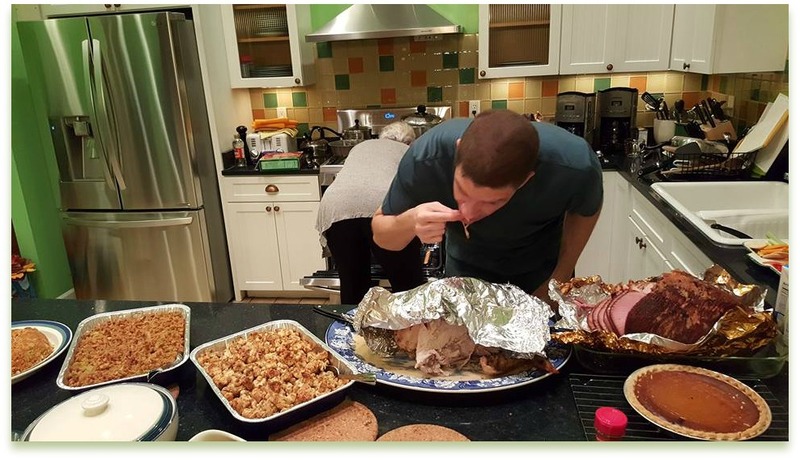 Thanksgiving 2015 – Sneaking A Taste Of The Turkey! Now. making jumbo sized cinnamon rolls from scratch in my kitchen is one thing but it is not so easy to prepare a batch or two in someone else’s kitchen. In 2014, I tried the “prepare and freeze before baking” method. 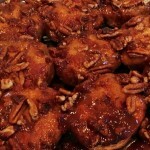 Don’t waste your time – it does not produce light, fluffy rolls oozing with butter and caramel. Let me re-phrase that to say “as light and fluffy” – I was quite disappointed. So this year, I set out to re-invent the recipe for my cinnamon rolls but also come up with a quick and easy traveling version that did not disappoint the chef or the bed & breakfast guests who have all, at one point or another over the years, tasted the original version. Mind you, this Mom, Grandma, Aunt, and sister-in-law was the only one disappointed in the results last year. But why spend the time preparing what is a relatively expensive breakfast treat when it does not measure up to past recipes? Although they ate one batch piping hot right out of the oven, they reheated the second batch for breakfast the next day. Pictured at right are the rolls that did not make my grade. The 2015 recipe is the ultimate in simple homemade cinnamon rolls and the closest in taste to my homemade rolls. In size, these are mini compared to my regular “Cinnabon®” sized rolls. At home, I use a super-sized pan like this one to proof the 1 inch thick slices of dough. It is impossible to determine the type of kitchen paraphernalia one will find in a stranger’s kitchen – particularly assorted bakeware pieces which are rarely found in rental properties. I prevented any surprise by bringing disposable foil cake pans and cookie sheets. Some rentals come fully equipped reflecting the cooking skills and entertaining habits of the owner while others, such as the one we had this year, provided the bare and basic minimum in kitchen utensils, pots, and pans. To avoid any surprise, I prepared nearly all recipes destined for the oven in disposable foil pans. Above is the Pyrex pie plate version of the simple homemade cinnamon rolls. I never give up until they turn out exactly the way I want them so, post Thanksgiving, there was a lot of experimenting going on. I made two batches this year to include one for the bacon lovers in the family. Local, freshly made sausage was featured for breakfast. You know I had to sneak the bacon somewhere into breakfast if not on the plate itself! There were no complaints! These cinnamon rolls were quick and easy to bake. There is plenty of cinnamon flavor in the prepared dough. The rolls are soft and buttery even if they do not come close in size to the homemade version. By the way, forget the little tubs of glaze that comes with the pack of rolls. With a thick caramel glaze, you really do not need to add a sugary glaze. 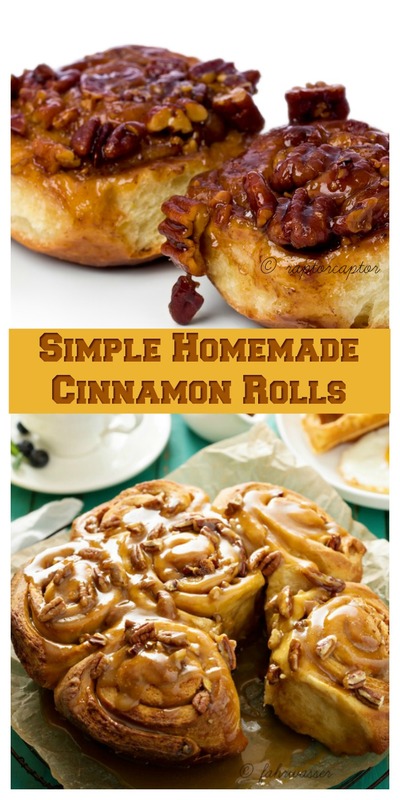 Enjoy simple homemade cinnamon rolls! Add a crunchy bacon crumble to the traditional caramel cinnamon roll! The ingredients listed above make two pans of cinnamon rolls. I prepared one pan plain (with just chopped pecans) and the other pan with a combination of the chopped pecans and crumbled bacon. Preheat the oven to the temperature stated on the package label. To each foil pan add a stick of unsalted butter. Yes, one whole stick per pan. I melted the butter two ways – by sitting one foil pan over the cooked sausage and the other over the oven vent. Allow to melt slowly so that it does not brown. The foil pans are too thin to place directly on a burner – electric or gas. I had preheated the oven and the heat from the oven was sufficient to melt the butter. When melted, add half the light brown sugar to each pan and stir to combine well. Continue to stir until you see the brown sugar melting in the butter. You want a smooth caramel sauce not a grainy, sugary coating. Stir until the caramel is smooth then, with the back of a large spoon, spread it evenly across the pan. Remove the foil pan from the heat source. Sprinkle half of the chopped pecans in each pan. In one of the pans, spinkle the crumbled bacon over the chopped pecans. Add the seperated rolls to each pan. There is plenty of room for 12 rolls per pan with a little wiggle room between each rolls. You want room between the rolls so the caramel sauce can drizzle between them when the pan is inverted. I used a disposable foil cookie sheet for this purpose. Place each cake pan on a rigid cookie sheet. Top with a cookie sheet and flip. Allow the steam to loosen the rolls. They will drop from the pan and the caramel sauce will fill all the nooks and crannies! 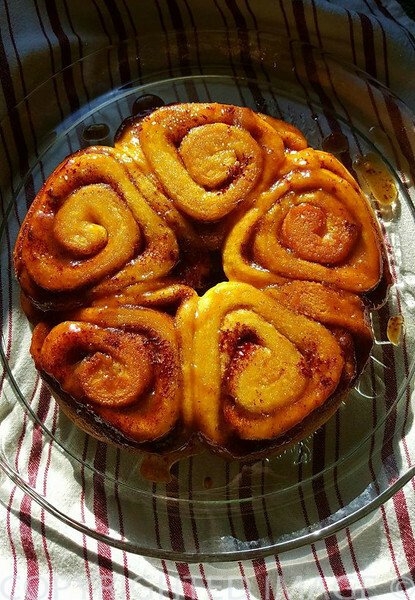 Laura assures us that this recipe for cinnamon rolls is the most requested in her repertoire. 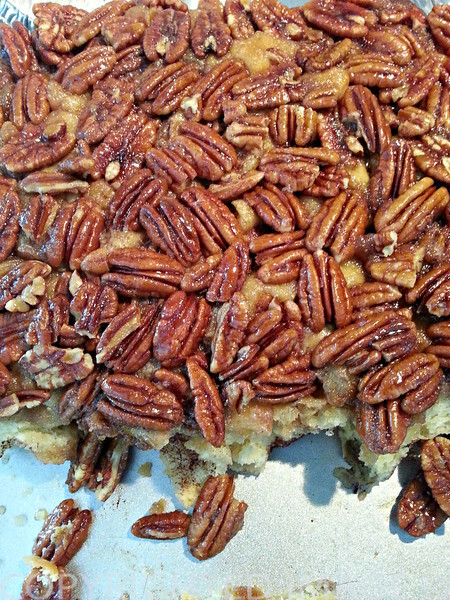 But…do they taste as good as my original sticky buns or are they as quick to make as my simple homemade cinnamon rolls? 2.1 Use Disposable Foil Pans!